Posted on Wednesday, August 28th, 2013 at 10:46 am. As the NFL preseason gets ready to roll into its final week, teams are busy cutting their rosters on their quest to the final 53 men who will lead their respective teams into the regular season. With another round to go, franchises have made cuts so far to get to 75. Many have survived so far. Many of these players have been through this before. They have endured training camps and OTA’s and the preseason. For others, this is all new and this is their first rodeo. Unfortunately, in the quest for 53, there are those who don’t make it. Below are some of the unexpected cuts done so far. These are veterans who have been there, done that, and now have to find a new home. Their hope remains as one man’s trash is another man’s treasure. Life in the NFL is often one of change and some of these players will land on their feet somewhere. Dan Carpenter K Arizona – Dan Carpenter is a popular guy. After Miami surprisingly cut him, he was pursued by a number of franchises before settling with the Arizona Cardinals to battle with Jay Feely. Let’s not forget that Carpenter is a popular guy and it only took him a couple of days for the New York Jets, a team that wanted him previously, to sign him and let their consolation prize, Billy Cundiff, go. Carpenter will still need to beat out Nick Folk. Terrance Copper WR Kansas City – Terrance Copper is best known as the fourth option of the New Orleans Saints juggernaut passing attack. He’s spent the last four seasons in Kansas City and not accomplishing all that much. It comes as no surprise that the Chiefs have decided to part ways. Considering Copper’s pedestrian numbers, this could be it for him in the NFL. Josh Cribbs WR/KR Oakland – After 8 seasons in Cleveland, where Josh returned 11 kicks or punts for touchdowns, he moved on to Oakland for the next chapter of his career. His surgically repaired knee altered his plans as it lead to his release. Perhaps some more rehab can eventually land this return specialist somewhere. Billy Cundiff K New York Jets – It’s a little unconventional to list not only one, but two kickers on a list of notable players, but when one vet is cut because the other was cut and then signed is reason enough to be called out. Cundiff was perfect on his kicks this preseason, but that was enough motivation for the Jets to keep him when their top choice, Dan Carpenter, became available. Cundiff struggled in 2012 with Washington, but on multiple occasions, he has stepped in midseason to do a respectable job. Perhaps Cundiff might make it a mission to try and play for all 32 teams. He has played with 12 already. Aaron Curry LB New York Giants – There were high hopes and expectations when Aaron Curry was first drafted by Seattle in 2009. It looked like he would be a good linebacker when the injury bug hit and derailed his 2012 season. His knee trouble continued to plague him in 2013 and the New York Giants let him go. Braylon Edwards WR New York Jets – Braylon has always been a case of what could have been. After showing potential in a breakout season in 2007, he just never put it all together. As it turned out, that one season may be his only 1000 yard receiving campaign. His last two seasons, he has been a shadow of his former self totaling under 200 yards receiving each season. The Jets gave Edwards a chance, but it just wasn’t meant to be. This could be it for Edwards in the NFL. Derek Hagan WR Tampa Bay – For a wide receiver, Derek Hagan is pretty well traveled. At age 28, he is already on his 5th team in Tampa Bay. Even though he has solidified himself as a journeyman player, Hagan has the speed to be able to fit in as a 4th option somewhere when injuries open up a spot. Chris Hope DB Detroit – Chris Hope used to be one of the defensive backfield staples of the Tennessee Titans. His last season as a full time starter was 2010 and his output has dropped significantly since. Joining the Detroit Lions this offseason, Hope was to bring veteran leadership to the locker room. The drawback of being a veteran is commanding a larger salary than younger players with greater impact on the salary cap. Chris Hope should still be able to offer some veteran leadership and will probably be picked up when injuries open the door at some point. Joe McKnight RB New York Jets – Joe McKnight is a metaphor of the New York Jets over the last couple of seasons. There has been plenty of potential, but none of it came to fruition. McKnight had some flash as a kick returner, but that was it. When he was on the field, his offensive game never came together and his time with the Jets ended without ever scoring an offensive touchdown. McKnight should land somewhere as a backup, but with the glut of talent out there, there is no guarantee. Kenny Phillips SS Philadelphia – Kenny Phillips was outstanding during his first four seasons with the New York Giants. Nagging knee problems slowed him in New York and followed him to Philadelphia. Phillips is only 26, so a team might give him another shot. Visanthe Shiancoe TE Baltimore – Baltimore cutting Shiancoe is a bit of a surprise considering the injury to Dennis Pitta. While he shrunk into obscurity in New England last season, he joined the Ravens and it looked like opportunity was knocking to return to the consistent outlet he was in Minnesota. He dropped too many passes and Baltimore decided to move on. There is no reason to believe that Visanthe Shiancoe will not land somewhere else. He has plenty of game left in the tank. Donte’ Stallworth WR Washington – Oft-injured receiver Donte’ Stallworth was playing with a stacked deck. After a nearly non-existent stint with New England in 2012, he went back to the franchise he called home in 2011, but he had to deal with a deep squad of wide receivers. A nagging hamstring injury made it that much tougher for him. Stallworth has not been able to put it together after a drunk driving incident forced him to sit out the 2009 season. Jeremy Trueblood OT Washington – In 2011, Jeremy Trueblood was a staple of the offensive line in Tampa Bay. After six seasons entrenched as the starter, injuries in 2012 lead him to lose his starting spot to Demar Dotson. He latched on with Washington, hoping to regain the magic he had in Tampa, but it was not meant to be. Vince Young QB Green Bay – Why is Vince Young mentioned? Vince Young is mentioned because he is what some of the players just cut could become and that there is life after losing your previous job. After being exiled from football in 2012, Vince Young never quit on trying to return to the league. He used his rough 2011 season as motivation to improve and was able to wow the Green Bay Packers into signing him onto their preseason roster. 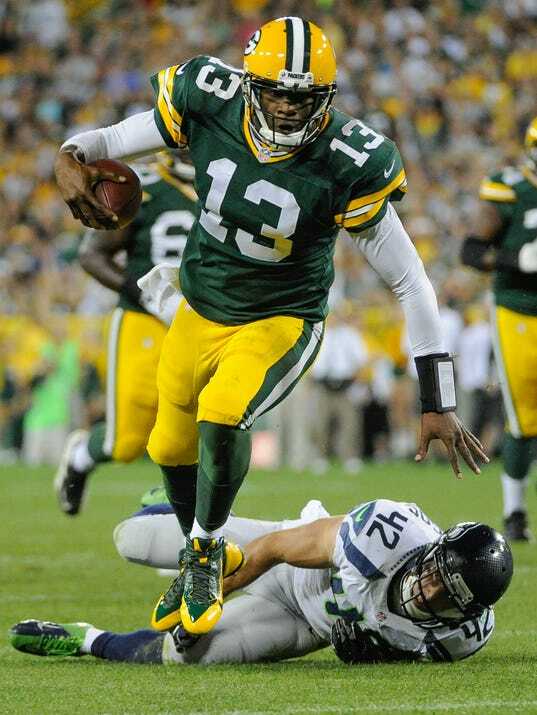 He was able to out practice and out play Graham Harrell and won himself the backup job. Don’t worry; there will be plenty of other cuts coming as teams trim from 75 to 53. Stay tuned for more.